Let’s talk market deals. I know I have discussed market savings in terms of longevity and quality, but I have yet to mention a word on straight up monetary savings. 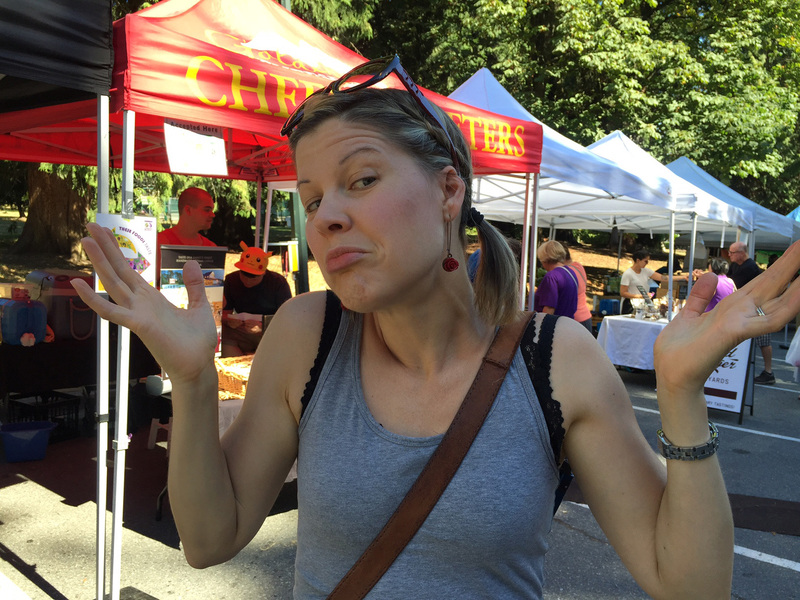 Farmers’ markets get a bad rap when it comes to pricing. 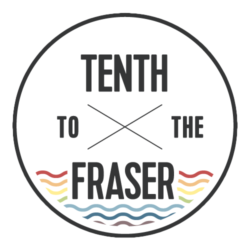 Some not familiar with New Westminster’s bi-weekly haunt have said it’s too expensive; they can get twice as much at the supermarket than at the farmer’s market. I propose we challenge that too-oft-heard stereotype. As we all know, I have a $40 budget that I try to balance to a tee. In doing so, I am not shy about letting vendors know what my budget is, what my plans for the week are, and what I can guiltlessly spend on their product. 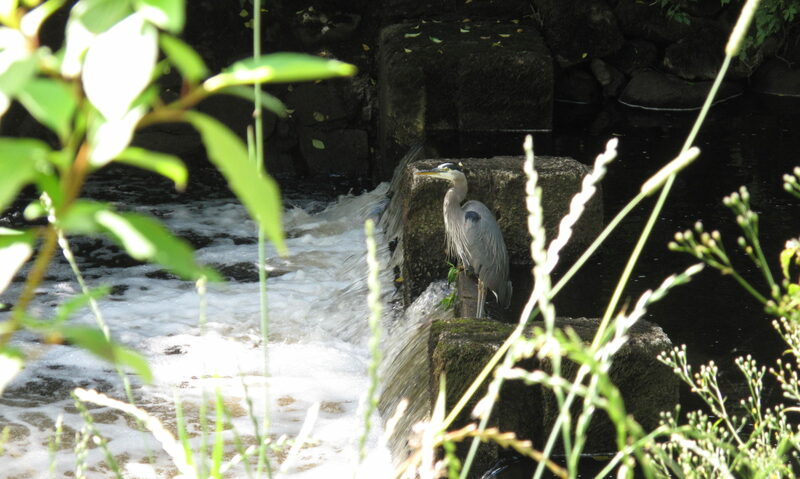 I first walked up to Kevin at Bose Farms. To be honest, Kevin has thrown me for a loop every market since the summer. His prices are dirt cheap compared to grocery stores, and to a few of the other venders in the circuit. By all accounts, he does not fit the aforementioned stereotype. On top of that, his listed prices are often not the prices you’re going to pay when you get up to the cash box. All prices, whether carrots, Brussels sprouts, squash, or potatoes, are listed per pound. As I contemplated the spaghetti squash, Kevin sidled up next to me, and whispered the price he’d charge was actually nearly half of the $2 a pound listed. That, alone, had me grabbing for the football-sized veggie. When he put it on the scale, he grimaced. At $2 a pound it would have cost $8, at $1.25 a pound, it would have cost $5. For me, that was a total score, but for Kevin, he could not consciously charge me $5 for something that cost way less to produce. Off came yet another dollar. I also picked up a bunch of carrots ($1.40), a bag of Brussels sprouts ($2.50), and a bulky bag of kale ($1.50). I’m not the best at math, but my calculator says that should have totalled $5.40. Kevin’s price: $4! He excused it by saying he’s not organic: that his prices are still more than what it costs to produce; and finally, that he’s kind of goofy like that. I’m hard pressed to name a supermarket that has a consumer-based conscious like that. Bose Farms wasn’t the only one handing out deals. Just like you and I, these farmers aren’t fans of loose change. It’s easy to lose, it weighs down the cash box, they want nothing to do with it. So most that charge per pound, including Ossome Acres and Sweet Earth Organics, will round DOWN to the nearest quarter. You may balk thinking it’s just nickels and dimes, but hold on a sec, nickels and dimes add up to quarters and dollars. Over time, it is a significant savings. Again, when was the last time a grocery store did that for you? In fact, since the removal of the penny, most times, they round up! 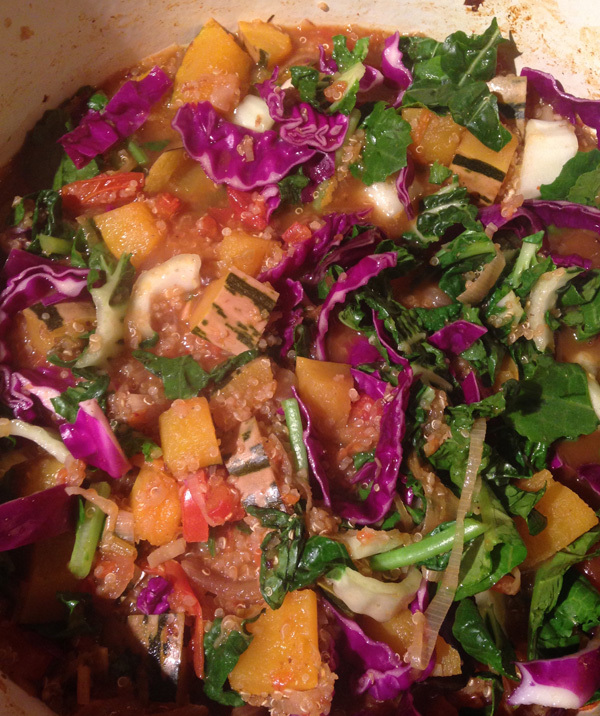 Given the chillier weather, I figured soup was very much in order. I hopped over to the Tasty & Nourishing soup table. So. Many. Flavours. 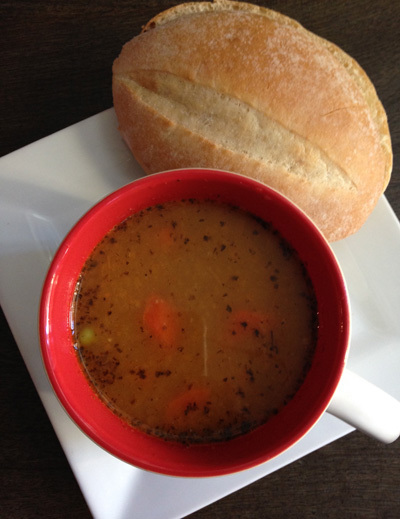 There was roasted red pepper and tomato soup, cauliflower soup, vegetable soup, cream of kale and leek soup, broccoli and cream of parsnip soup, green pea and quinoa dumpling soup, green bean and mushroom soup, bean and chorizo soup, split pea soup, and chicken paprikash soup. They all sounded so good; I had a hard time choosing. I narrowed it down to the split pea and the green pea and dumpling soup. I love split pea, but was intrigued by the dumplings. Instead of suggesting I buy both, Adrianna, the company’s founder, suggested I buy the dumpling soup and take a sample of the split pea. When she said sample, I thought I’d get a small yogurt cup size, nope I got a full bowl and a halfs worth!!! I can assure you I have never got a sample size this significant from a grocery store. And finally, we’ve got our bite-sized samples. This is not a monetary savings, no, and many grocery stores have cookie samples, yes, but how many of us know exactly what is going into those cookies, and how many little fingers have been all over those cookies? I don’t, and frankly, I haven’t touched one since I was about eight years old. But the market samples, usually handed out on toothpicks or passed over via tongs, it’s pretty safe to say are hazard free. The makers and bakers are there telling you exactly what’s in them, what their origins are, how they were made, and when they were last baked. I got a taste of pure organic apple sauce, a bite of a turmeric muffin, an offering of beef jerky, a savoury pakora, a slice of scone, and a full-sized, melt-in-your-mouth, sweet, sweet choquette from Baguette and Co.
“In Canada, you eat popcorn with movies; in France, we eat chouquettes,” laughed Bernard of Baguette and Co.
Before purchasing the preservative-free Schrippen bun I was 75 cents short of my $40 budget. I was determined to break even, and searched high and low for something 75 cents on the dot. But unfortunately, it was either 60 cents for the bun, or a $1.25 for a pretzel – nothing in between. I opted for the bun, which left me 15 cents under budget. That was not acceptable. Instead of stuffing it into my pocket, it went into the guitar case of the local entertainer Jen Hiltz. Now, you would think after all those samples, I would have been way too full for a proper lunch back home. And I was decently full, but the thing is, the bun was preservative-free, and even though the woman behind the Healthier Choice counter told me it would last fine in the fridge, I just could not take my chances. And so, another great market adventure, made all the better with the surprise savings, was closed with a proper-good market fresh sandwich. Needed talented mouth-widening skills for this one. 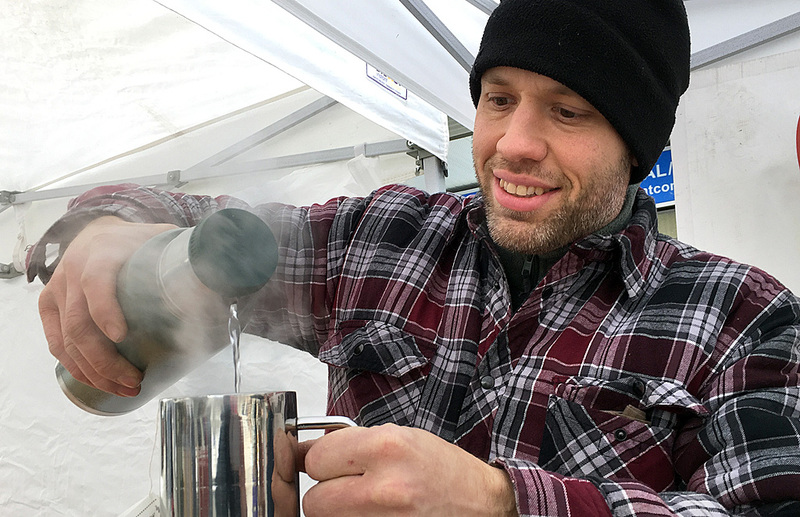 Snow, ice and sub-zero temperatures help put the winter into the Royal City Winter Farmer’s Market on Saturday. Snow and ice put the winter back into Saturday’s final Winter Farmer’s Market of 2016. But Jason, at Gary’s Kettle Corn, wasn’t feeling the frosty temperatures. In fact, he was so comfortable he was wearing just a t-shirt as he hovered over the propane burners heating the 80-quart kettle where the kernels are popped full of sweet and salty flavour. “I definitely have the warmest spot on the block,” he chuckled as his shivering assistant served a customer just outside their booth’s heat zone. 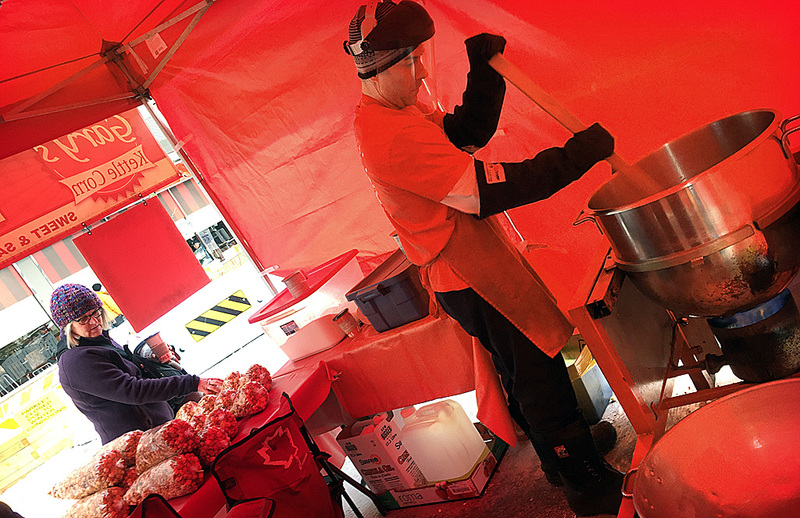 A t-shirt is all Jason needs to stay warm as he works the giant kettle at Garry’s Kettle Corn. 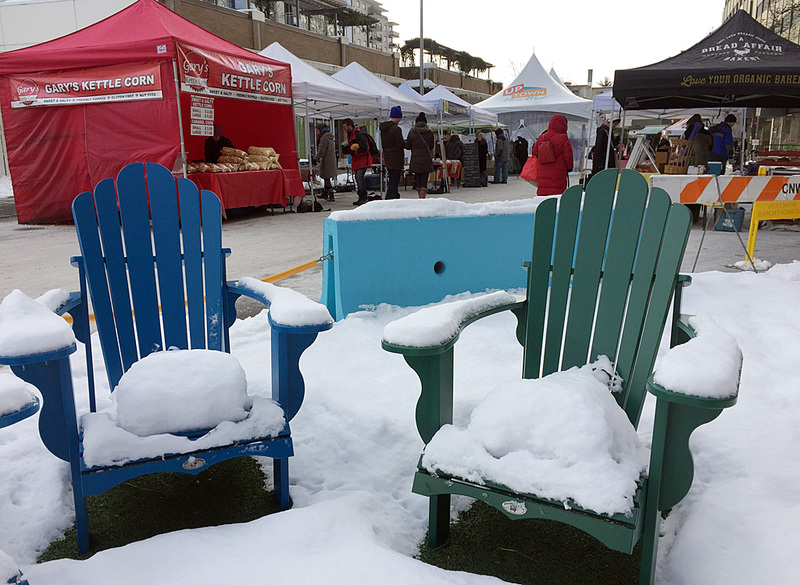 Since moving uptown and outside last year, the Royal City Winter Farmer’s Market has been anything but wintery. 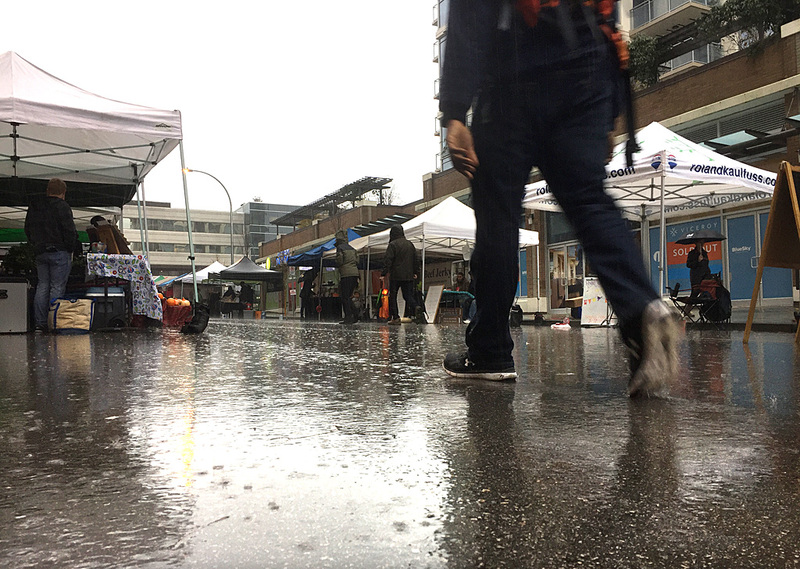 Oh sure, there’s been plenty of rainy and cold market days, but Saturday’s setting of snow and ice was a first for many of the vendors. And they were doing everything they could think of to stay warm. Like Tara at Roasters Hot Sauce; she was thinking about enjoying a hot toddy in her warm apartment to take the icy edge off that her six layers of shirts and sweaters couldn’t. 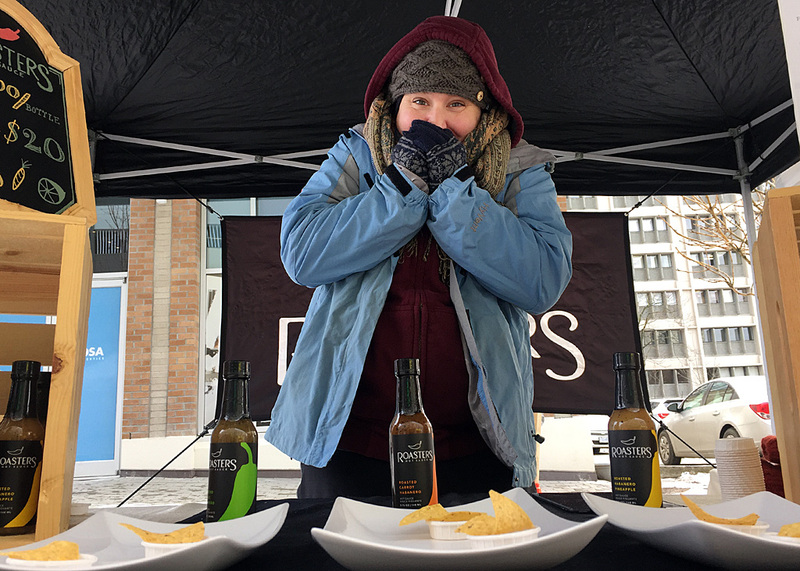 The hot sauces at Roasters may warm the insides, but Tara is relying on six layers and Hot Pockets to keep her outsides toasty at Saturday’s chilly Winter Farmer’s Market. Layering is the key, said Michelle and Kathryn at Kiki’s Kitchen. They each topped a half-dozen layers of undershirts and cashmere with matching orange puffy jackets. Experience helps too, said Kathryn. She’s originally from Montreal so she spent plenty of time having a good time in the snow and cold. 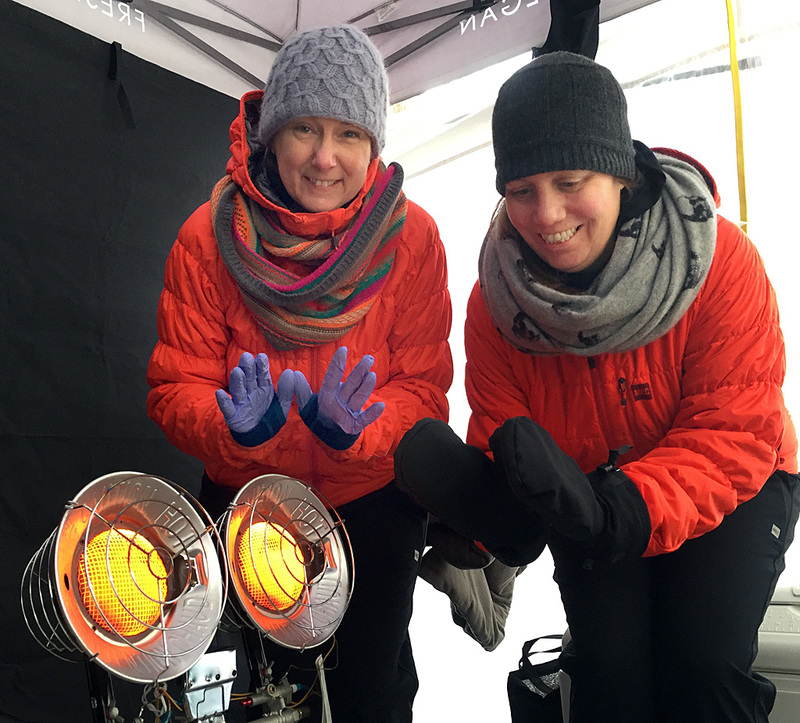 Matching puffy orange jackets and a propane space heater keep Michelle and Kathryn toasty in the Kiki Kitchen kiosk. “You’ve got to dance around, keep moving,” she said as the pair bopped around a propane space heater at the back of their booth. Over at A Bread Affair, Cierra’s dancing was more like rocking back and forth from foot to foot. But her kiosk is closest to the Tim Horton’s so she was able to steal away for a hot coffee and a few moments of thawing out whenever traffic slowed. “This is better than rain,” she said, optimistically. 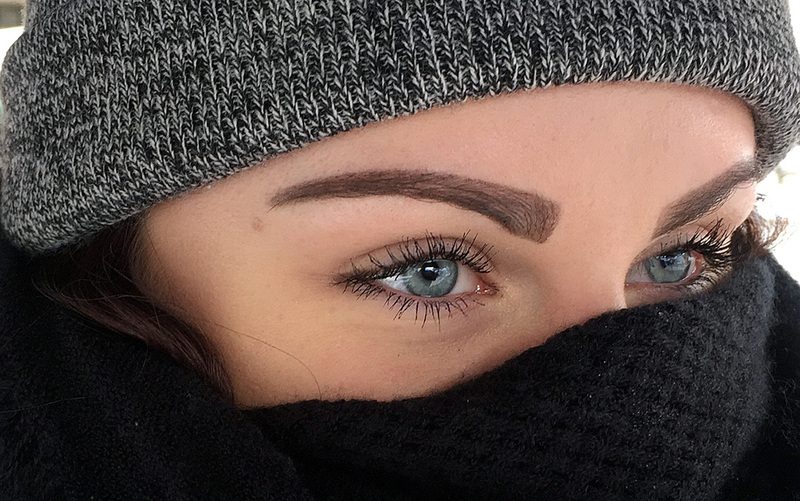 Cierra, of A Bread Affair, is bundled up to her eyeballs. Many of the vendors had the cold well in hand. They had chemical warming packets stuffed into gloves and socks. 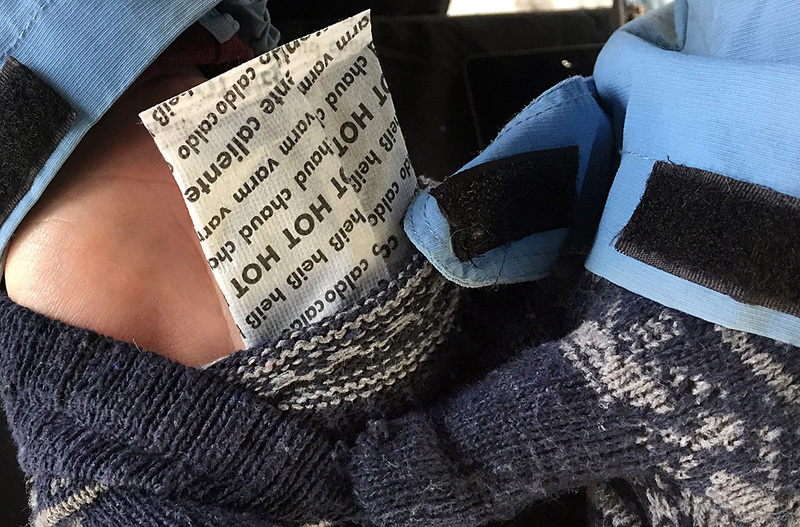 Chemical warming packets are the key to staying warm at Saturday’s Winter Farmers Market say many of the vendors. “I love that we’re all in this together,” said Amanda at Honey Bee Zen. Amanda tries to stay warm at ther Honey Bee Zen kiosk. But for Aaron at Ossome Acres, the frigid temperatures presented a new and unexpected challenge. “We have to keep our eggs in the coolers to keep them from freezing,” he said. Aaron pours a steaming mug of tea to stay warm in the Ossome Acres booth. The next Royal City Winter Farmer’s Market will be January 7. 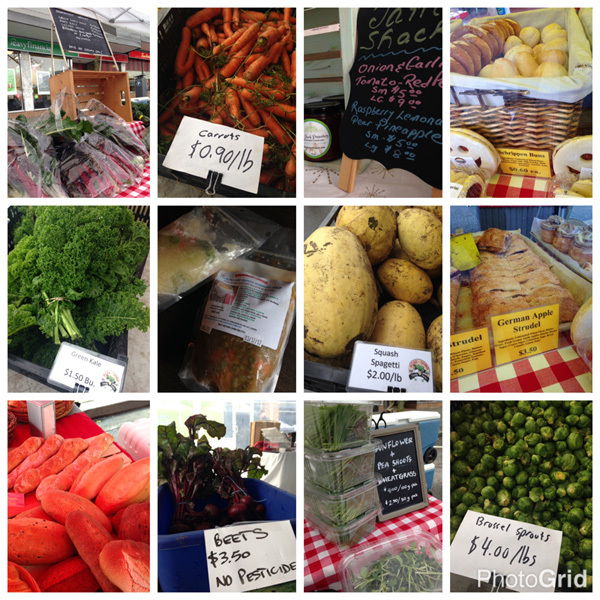 So enjoy the holiday, and the treats from this week’s chilly market! 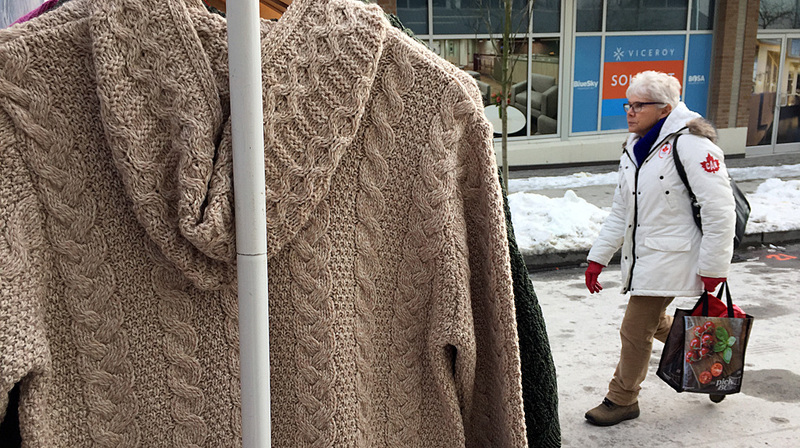 A rack of hand-knit sweaters is an enticement to shoppers trying to stay warm at Saturday’s chilly Royal City Winter Farmer’s Market. It’s funny how Winter Market Season always seems to coincide with Rainy Season. Just like your favourite TV show, the Farmer’s Market Challenge has been renewed for another season. Except this is the winter market, which should make for some bold new adventures in comfort cooking in the months ahead. 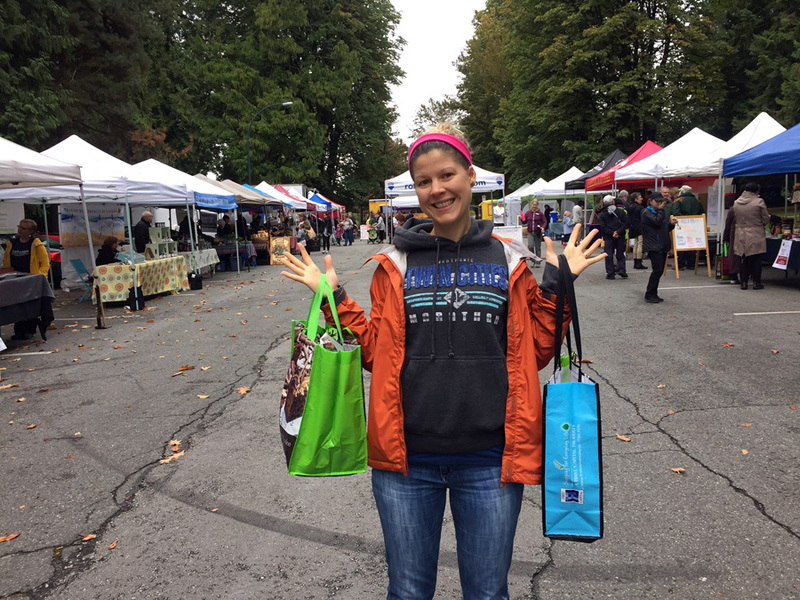 While the summer market at Tipperary Park is all about tender salad greens, crisp red peppers, sweet, juicy berries and hanging out with your neighbours under the shade trees, the winter market is root vegetables and ducking out of the rain. If there’s moisture falling from the leaden sky, it must be time for winter marketing. Nothing a little Gore-Tex can’t handle. The renewal of the Market Challenge was a bit unexpected. In fact, it was just happenstance that brought us to the market in the first place. So we were a bit unprepared; no meal plan, no list, no recipes that required specific ingredients, no shopping strategy. Instead we relied on instinct. A quick scouting mission up and down Belmont Street revealed the return of some summertime favourites like Ossome Acres and Wild West Coast Seafoods. 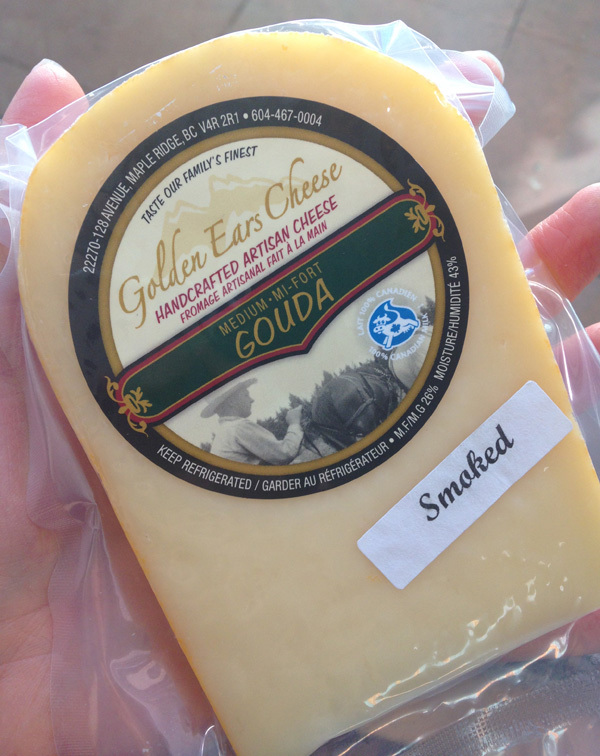 And there’s some new vendors, like Sweet Earth Farms. Salad greens, our weekly staple during the summer Market Challenge, were sparse. But Ripple Creek came through with a hefty bag of super mixed greens and a handsome bunch of leafy, purple-veined Russian kale. Add a bag of organic arugula and a head of organic butter lettuce from Sweet Earth Farms, as well as some tender pea shoots from Ossome, and we were confident the flavour would return to our nightly dinner salads. Stocking our salad spinner was the easy part. But this is supposed to be a Market Challenge, which means breaking from comfortable routines, learning new things, taking our marketing in surprising new directions. Fresh pine mushrooms foraged from a hemlock forest in the eastern Fraser Valley by Matt McAllister of Your Wildest Foods. Enter Your Wildest Foods. Or as we came to call him every time we passed by his stall during the summer market, “Mushroom Guy.” Then, we had every intention to sample his wares. But frankly, we had no idea how to use his array of exotic dried mushrooms. And, they were expensive. But this time, in the spirit of renewed adventure, we stopped. Next to the usual pouches of dried funghi, Matt McAllister (aka “Mushroom Guy”) had heaped baskets full of fresh, bulbous chanterelles, porcini and pine ’shrooms, all of which he’d foraged himself in the forests of the eastern Fraser Valley. The season was slow to start, said McAllister, but was now proving bountiful. Picking wild mushrooms is slow, careful laborious work; hence their hefty price. But the payoff is pungent, earthy funghi that can be used in so many ways. 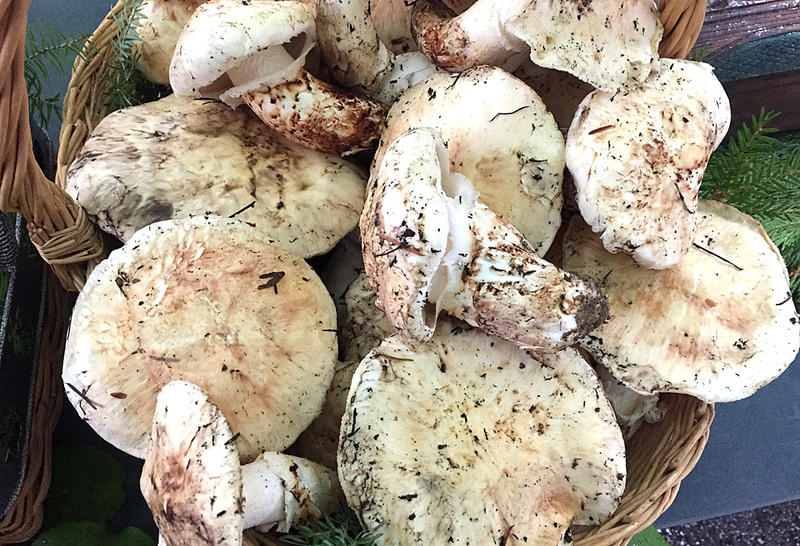 McAllister recommended the pine mushrooms, perfect for light grilling to bring out their full smokey flavour, basted lightly with olive oil and sprinkled with some dried rosemary. 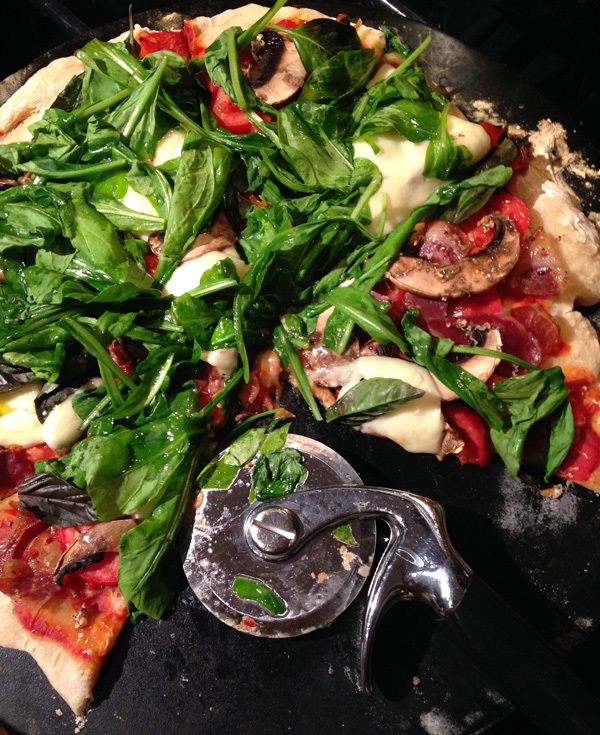 One of the grilled, smokey pine mushrooms ended up on a pizza with proscutto and fresh arugula. 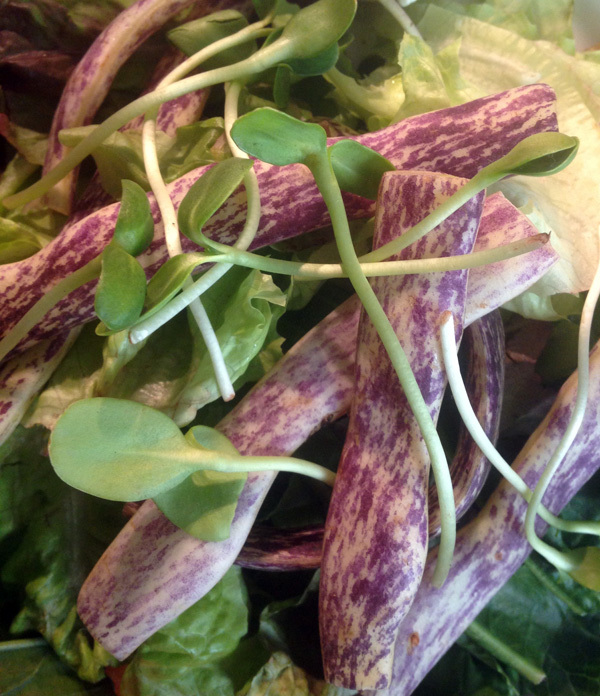 Another ended up as a garnish on a salad of mixed “super greens” and pea shoots. And the third went into a plate of spaghettini funghi, with parmesan and olive oil. Our’s ended up in three dishes: a topping on grilled pizza; a garnish on a garden salad; and mixed into spaghettini with olive oil and parmesan. All were boosted to new, flavourful heights. It can’t possibly be bread, it must be cake! They assured us it was bread. Last week was the final week of the summer market bringing the $40 market-spending challenge to a close. And in proper, good Katie form, I went all out. Early in the challenge, I would never have purchased an $8 loaf of bread, chocolate or not. My spending was based on a strict budget where veggies took precedent. But, as the summer market started preparing for fall, the veggie selection became less vast, and, well, sometimes you really do need a reward for doing a great job. I think I did a great job; chocolate bread was my reward. Sadly, I did not read the ingredients. I did not realize there was orange infused into that bread. I do not eat orange-infused sweet treats; haven’t since I was about five years old and some totally evil person decided to underhandedly slip marmalade onto my toast – blech! In my mind, orange does NOT belong in chocolate. 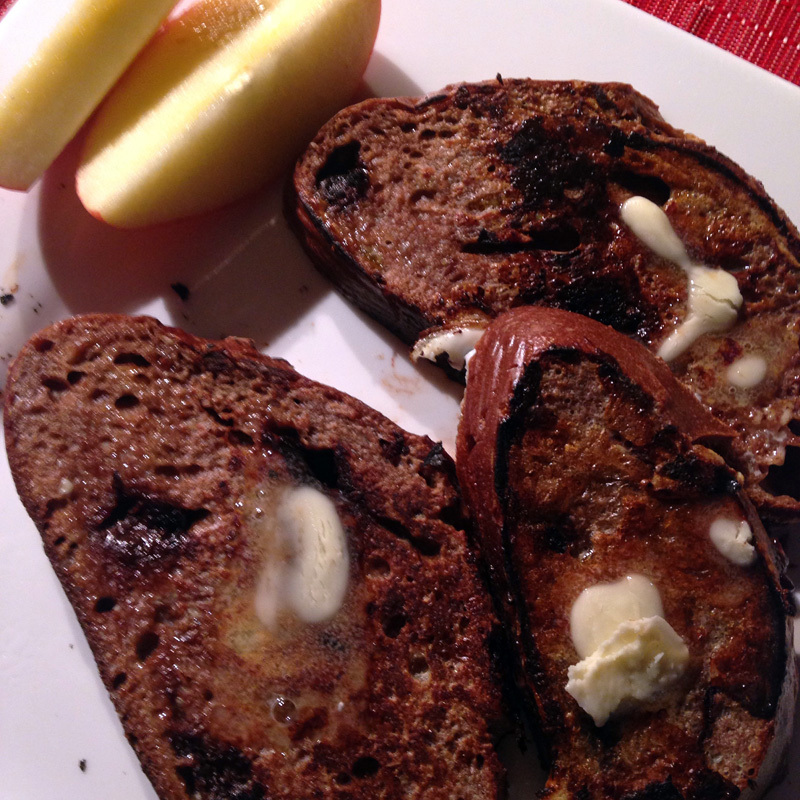 Plus, we may have overdone the sweet factor: Chocolate French toast, syrup and all. Holy decadence! When I started this challenge 16 weeks ago, I didn’t know what exactly it would present. 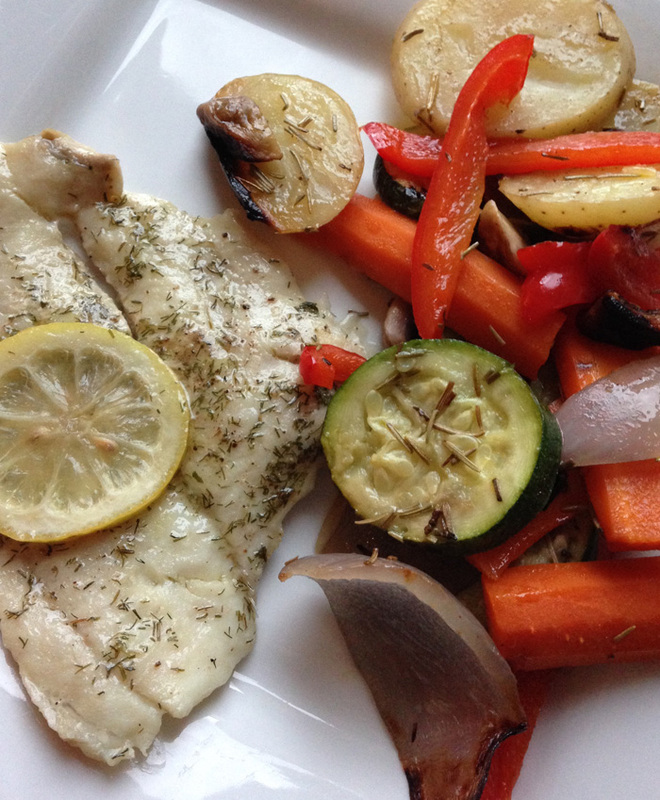 I considered our family on the upper scale of health prior to going in, but admittedly we were a bit stale and stagnant in meal planning, eating the same-old, same-old week after week. It gave us new foods, new recipes, new cooking adventures, new menus, new tastes, new perspectives. In my first post of this challenge, I asked if the market was true to its negative stereotype of being “too expensive,” a sentiment I have heard echoed several times by my fellow Food, Nutrition and Health peers at UBC. After 16 weeks, I can handedly say that yes, some of the product is pricier than you’d get at grocery stores. But, and this is a huge but, the quality, flavour and freshness is bar none far superior to that of the chains. When you know your food was picked that day, when you know your food hasn’t undergone chemical procedures to stall the ripening process, when you know every bite is going to be infused with an intense flavour that tickles your differing taste buds, when you know it’s going to last longer than a few days, as long as a FEW weeks even, that has to be factored into the budget. When you know how to shop the market, as I quickly learned, when you know how to search out the best deals (two for $5 mustard greens made my list EVERY week), when you know how to plan, when you build relationships with the farmers, when you know how to use so-called wastes to your advantage (onion stems was a favourite discovery), you DO see a savings. 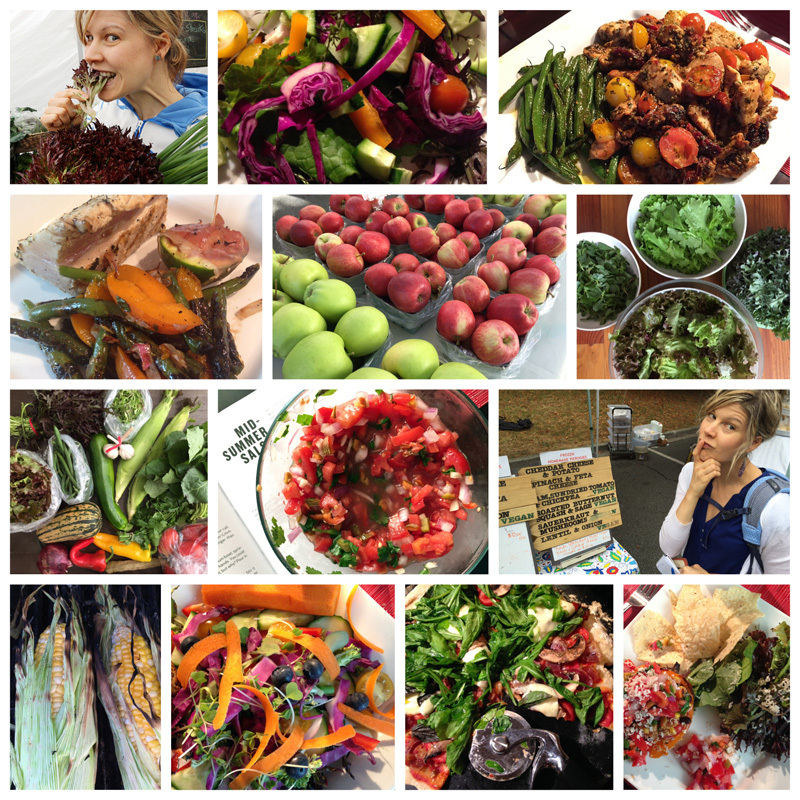 We stopped going to the veggie stand three times a week; our foods were lasting. We stopped buying salad dressings; the intensity of the greens didn’t require added flavouring. In meal planning, we started looking at multiple ways of using the entire vegetable – limited waste, so an environmental savings as well. There were challenges. A vegetable one week was not guaranteed the next; something you had hoped would be there, didn’t make the cut that week; if you weren’t there early, chances were the items you wanted were all gone. The week of no perogies! 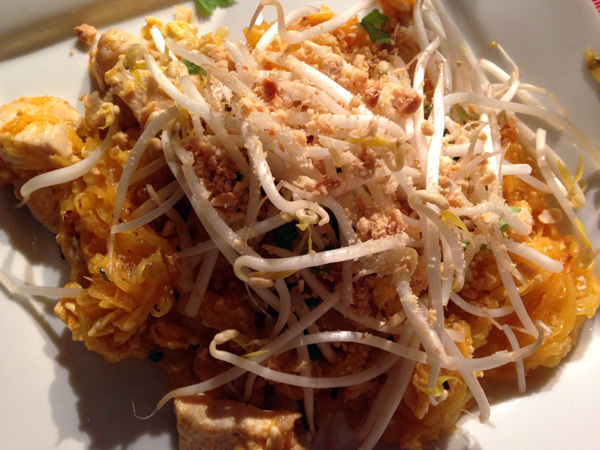 Our final market meal was a trusty favourite we discovered the third week of the challenge – tuna loin. Unfortunately it had jumped in price since the beginning of the summer; what cost $12 in June, cost $16 in October due to a “crummy” season. It meant fennel was scratched from the list. It meant none of the maybes on the list would get into our bag. But man, that tuna – a drool-worthy, dream-worthy delicacy! Worth every sacrifice. Worth every penny. Challenge complete. Where oh where to get my mustard greens now? Dear summer market, so much of you I shall miss. 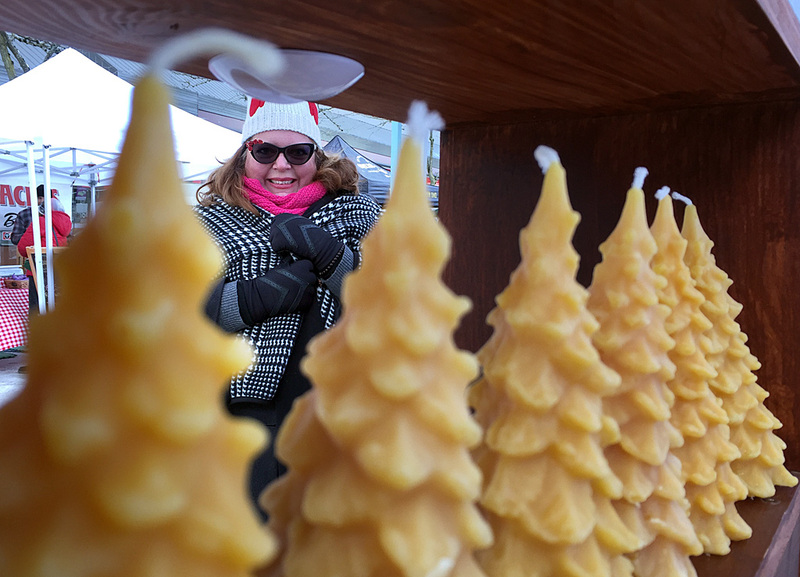 Winter market starts November 5, and runs the first and third Saturday of the month, uptown on Belmont street until the end of April. 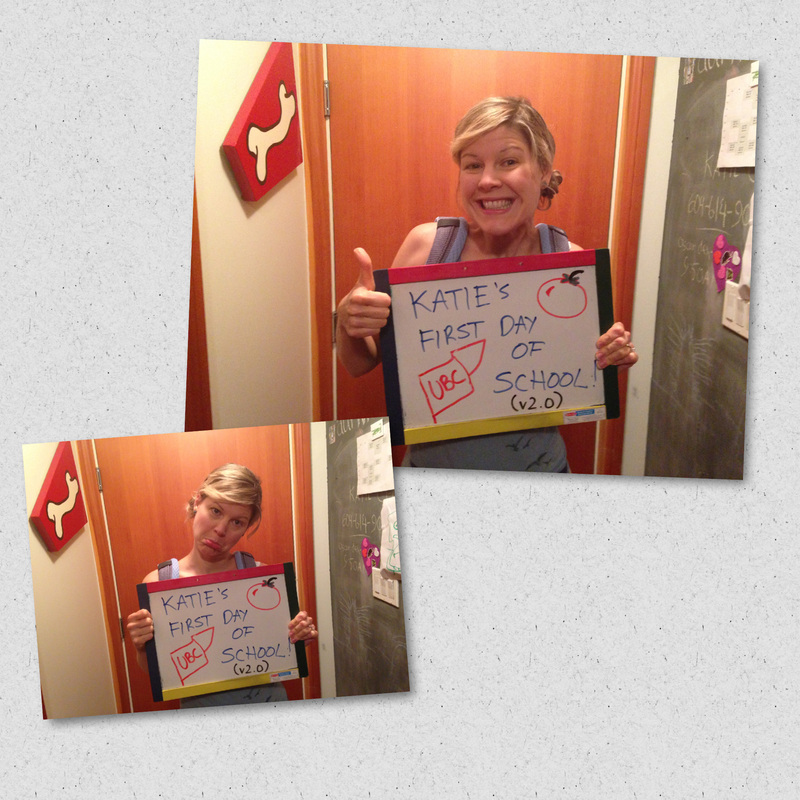 Last week Facebook was chock-a-block full of back-to-school pics: first day of preschool; first day of kindergarten; first day of Grade 1, 2, 3, you name the grade, the kids were representing. Mostly littles, some crying, some pouting, some high-fiving the sky with extreme excitement. Yes folks, last week was back-to-school for me too, and the first day at UBC. It was a big day, an exciting day, a day I’ve been waiting for for years – years! But it was also a stressful, unsure, somewhat bordering on sad day. Living in New Westminster, last year’s 10-minute walking commute to Douglas College has now become a one-hour (if I’m lucky) transit commute to UBC. That means crazy early mornings (three days start at 8 a.m.!!! ), some late evenings, and a whole lot of time away from my family. It means a lot of time grabbing breakfasts to-go. A lot of time eating on transit. A lot of time eating in class. A lot of time eating out of my backpack. I need quick, easy-to-prepare, grab-and-go, transportable snacks and meals – all without compromising taste and nutrition. I am not going to be your stereotypical frosh wasting away at the nearest McDonald’s. How could the farmers’ market help? 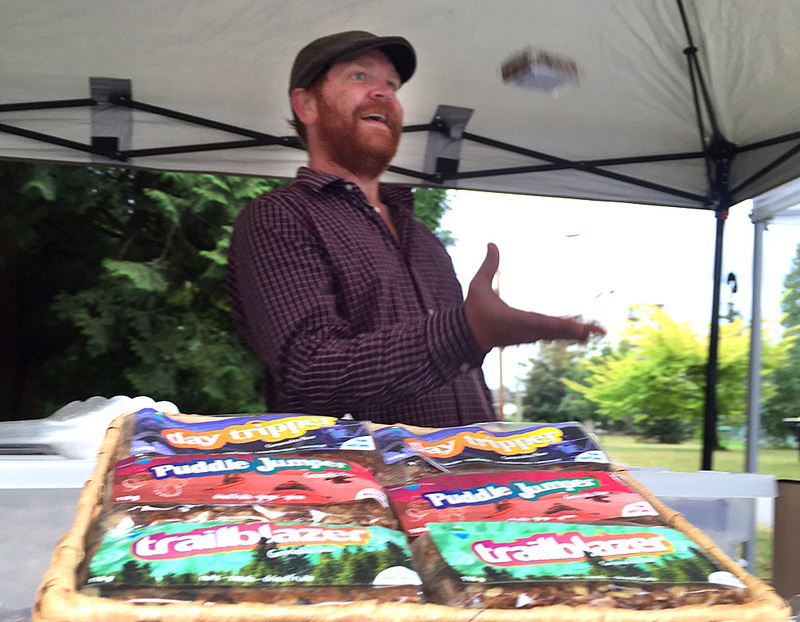 At the market two weeks ago, I met James Lewis, a Red Seal chef that is the mastermind behind Active Granola. When I first approached him, I thought for sure these bars were strictly for heavy-duty activity. I mean, one bar alone is upwards of 60-70 grams of carbohydrates. If I were regularly hiking for hours and hours, or on some crazy, long trail run, or bike ride, I wouldn’t think twice about gobbling one up. But, currently injured, with minimal energy being expended, and with diabetes always at top of mind – that is a LOT of insulin. But then I got to talking to him. Lewis showed me the ingredients, all clean and wholesome, all things I could pronounce, all things I knew. Throughout the conversation, he had me sample the three flavours, small, bite-size samples. I kid you not, my stomach started to feel the effects of fullness with just those three bites. I had eaten a quarter cup of almonds 1.5 hours prior to the conversation; my stomach was nowhere near full state before those bites. With a protein content of 10-11 grams and fibre of 6 grams per bar, not all that surprising really. And then it hit me. Early mornings. Long days. These bars, even at half their size (which is how I personally would consume them) and mixed with Greek yogurt or a banana or some other fruit, could be a student life/belly saver!!! Bam! Ten dollars later and I had the start of my back-to-school fuel program. Full disclosure: I purchased the bars two weeks ago, not last week. Lewis mentioned he wouldn’t be at the market this past week, and those three bites had me completely sold, I needed these bars. So I technically went $10 over budget last week, but counted it towards this week, giving me $30 left to spend. It is apple season my friends, have you been stocking up? Harvest Direct Farms has galas, Jonagolds, Macintosh, red delicious, ambrosia, etc., etc.. I’ve tried the galas and Jonagolds to date; the galas have become a family favourite. If you’ve been keeping up with these posts, you may recall me saying at the beginning of this challenge that the market fruit was a bit too pricey for my fruit-loving family to take advantage of given how much we eat. But here’s the thing, my husband doesn’t eat apples, leaving just the boy and I to share. 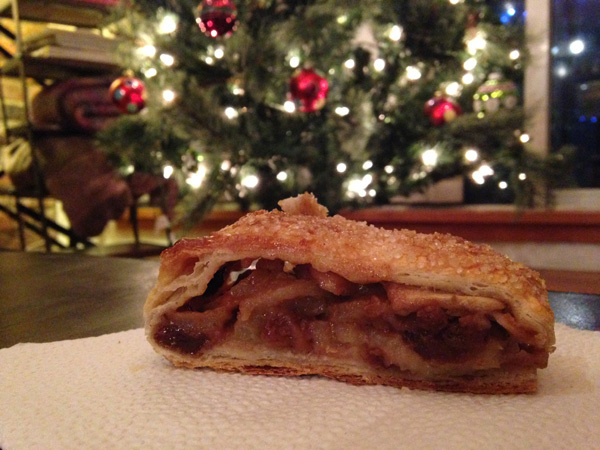 And frankly, in-season apples, how can we not indulge? They are 5,000 times tastier than store-bought. Even now, when apples everywhere are local, you still have to factor in transportation and storage time and storage atmosphere for store-bought apples. 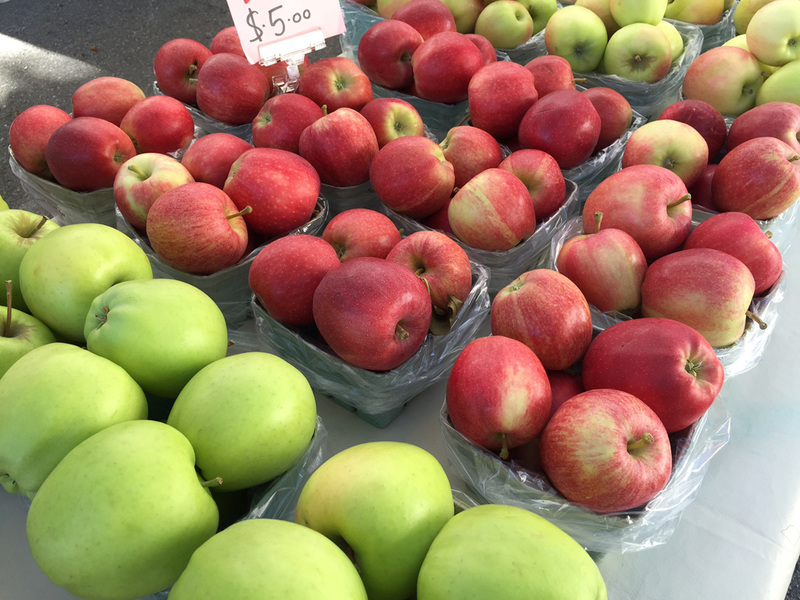 But at the market, these apples are either freshly picked that morning, or the day before. They are not uniform in shape, texture or size; they have actual character, which in my opinion adds to their quality. 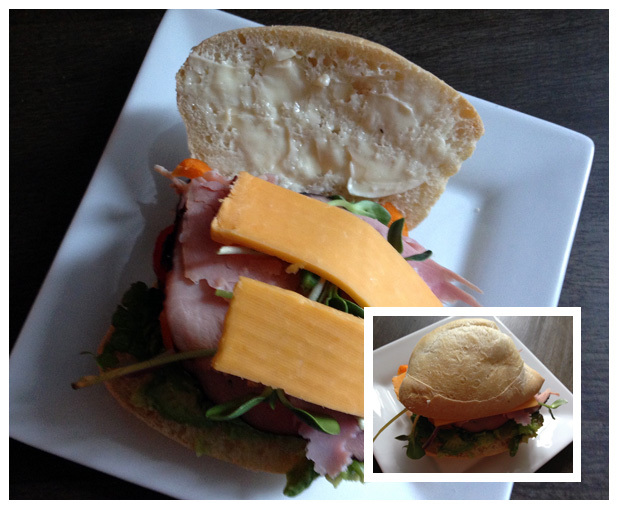 Snackwise, they are super easy: cut them up for no waste, or throw a whole one in your bag if low on time. Taste-wise, they are intensely sweet, super juicy, crazy crisp, and the majority are huge in size too, often the equivalent of two apples in one. No guilt chomping on one of those whatsoever. Lunches: salads, salads and more salads. this week’s salad featured amarra greens which are an Ethiopian kale that added a nice like kick a few seconds after the first bite, tatsoi mustard greens, which are very similar to spinach, sunflower shoots, that added a fresh crunch, and dragon-tongued beans – look at that colour! And let’s not forget dinner. I’m getting home a lot later than I was prior to UBC. We need meals that are going to be easy to reheat, easy for my husband to prepare with a four-year-old under foot, and good for leftovers. 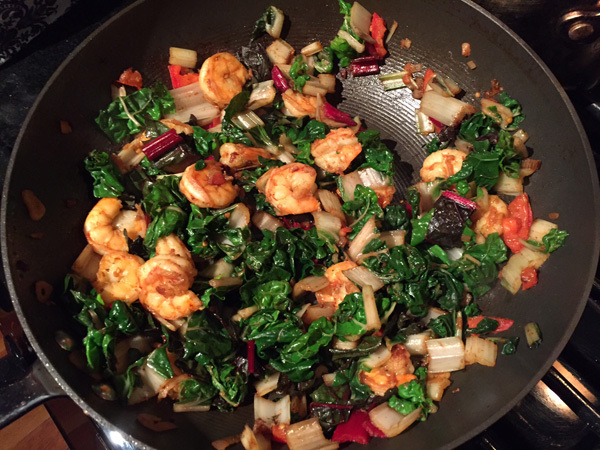 A lot of our market-discovered meals have come in handy this week: Mexican stuffed peppers; chicken and bean sauté; and shrimp and chard quinoa. Plus, a little market-fresh pizza indulgence too! Market ingredients: Arugula, roma tomatoes, garlic, and basil. Beyond the market ingredients: prosciutto, roasted red pepper, fungi, mozzarella and parmesan. How have you been handling foods for back to school?